Their deception revealed and their plans waylaid, two deadly and Hell-touched siblings make a desperate final play for control of Westcrown. With the city in chaos and its leaders fled, few stand to defend the beleaguered people when the plots of fiends turn upon them. At the same time, the rules of Cheliax launch their own ruthless plot to retake control. Can the PCs return order and shatter the Council of Thieves' age-old stranglehold on Westcrown once and for all? Or will the former capital slide fully into the grip of a terrible new deviltry? It's up to the PCs to decide in the climax of the Council of Thieves Adventure Path! 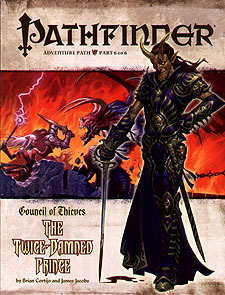 "The Twice-Damned Prince," a Pathfinder RPG adventure for 11th-level characters, by Brian Cortijo and James Jacobs. Catastrophic new rules for running a variety of calamities, from fires to floods, by Darrin Drader. New revelations on Mammon, the avaricious archdevil of Erebus, by F Wesley Schneider. Pathfinder Varian Jeggare and Radovan face down devilish plots and the laws of Cheliax itself in a gut-wrenching conclusion to the Pathfinder's Journal, by Dave Gross. Five new monsters, by Adam Daigle, F Wesley Schneider, Neil Spicer, and Hank Woon.